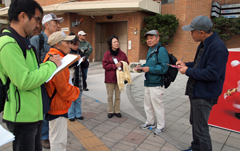 Led by Soko Furugen (second from right), members of the tour guide group visited the site of the Koza Riot. On December 20, at Chuo Street, Okinawa City. “Okinawan people’s pent-up anger towards the U.S. forces flared up, but they did not use violence against U.S. personnel. The people of Koza, which had developed alongside the bases, saw American soldiers as fellow human beings. That they did not use violence towards human beings is a good example of how the Okinawan people have universal values,” Furugen stressed. Okinawa City Tourism Association is training tour guides as part of its tourism promotion project. A total of 35 tour guides have finished the training course.